This page is for collecting every National Baseball Hall of Fame player with a connection to Arkansas. 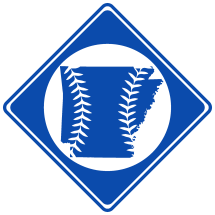 Though most involve spring training, the connection can be nearly anything, from spending your honeymoon in Arkansas to playing with a local team. However, merely playing a game or exhibition game in Arkansas does not count. Pete Alexander Trained in Hot Springs, AR. Cap Anson Trained in Hot Springs, AR. Ed Barrow Trained in Hot Springs, AR. Jake Beckley Trained in Hot Springs, AR. Cool Papa Bell Trained in Hot Springs, AR. Roger Bresnahan ) Trained in Hot Springs, AR. Lou Brock Born in El Dorado, AR. Mordecai Brown Trained in Hot Springs, AR. Jesse Burkett Trained in Hot Springs, AR. Roy Campanella Trained in Hot Springs, AR. Max Carey Trained in Hot Springs, AR. Frank Chance Trained in Hot Springs, AR. Happy Chandler Trained in Hot Springs, AR. Oscar Charleston Trained in Hot Springs, AR. Jack Chesbro Trained in Hot Springs, AR. Fred Clark Trained in Hot Springs, AR. John Clarkson Trained in Hot Springs, AR. Mickey Cochrane Trained in Hot Springs, AR. Jimmy Collins Trained in Hot Springs, AR. Charlie Comiskey Trained in Hot Springs, AR. Stan Coveleski Trained in Hot Springs, AR. Sam Crawford Trained in Hot Springs, AR. Joe Cronin Trained in Hot Springs, AR. Kiki Cuyler Trained in Hot Springs, AR. George Davis Trained in Hot Springs, AR. Bill Dickey Went to high school in Searcy, AR, Played for Little Rock Travelers (1925-1926, 1928, 1947). Chick Hafey Played with the Fort Smith Twins (1920).